I mean, I asked people to share their shelfies, so I guess this is a classic case of show me yours I'll show you mine. As you can see, if you were worried that you have the messiest shelf out there, you got nothing to be worried about. That's mine--after I cleaned it up. That's my traveling super hero group. The really sad thing about running shelfies while my whole library is in storage is that my whole library is in storage (cries into my borrowed copy of Harry Potter). Usually my shelves are filled with an equal mix: modern but not super new, Hot of the Press, and impossibly out of print. But with all the books in their boxes, my poor books are pretty lonely--and mostly the same mix (the hot off the press books are in a stack right next to the shelf waiting to be read!). The tootsie roll piggy bank was not staged. That's where it lives, full of pennies. I'm basically a really mature 12 year old. Incapable of giving up the things I love, but ready to crack open the mysteries of the universe... just after I finish this next GL book. 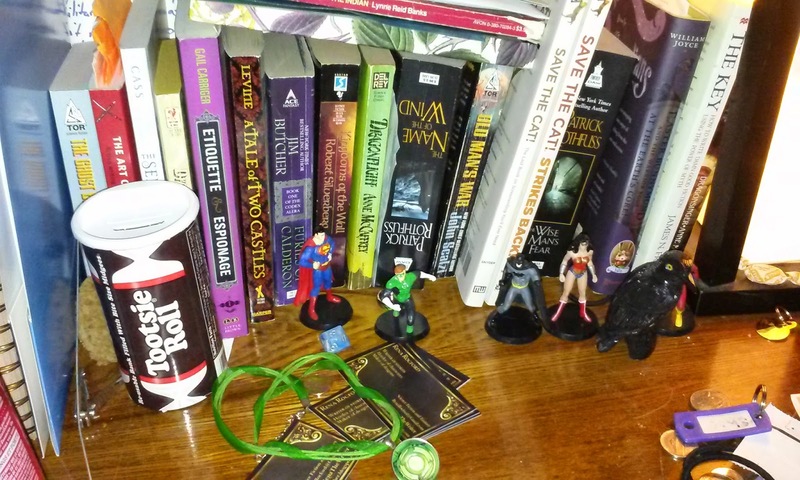 And if you have no idea what I'm talking about with all this shelfie business, it's a Blog hop. Go around and check out everyone entries!